We seem to be in a bar, perhaps at the Chicago Biograph. There are ‘drum peals’, references to Kierkegaard, the mathematician Euler, knights and fables. Perhaps the poem is a representation of the sounds of a drum solo, or of the mental spaces one might enter while considering philosophy or mathematics: ‘splintered/collapsed ledges… calculations/of overwhelming force.’ The poem teeters on the brink of representation, then kicks off in staccato bursts into the surreal. 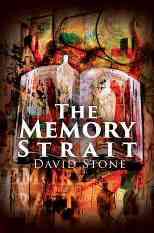 David Stone’s The Memory Strait is demanding reading. I first read through the collection as if listening to jazz, or to mid-career Bon Dylan perhaps, without trying to ‘make sense’ of anything too closely, then returned to unearth dominant images and patterns. The collection is ‘In Memoriam’. It is dedicated to Marilyn Stone (Stone’s wife, I assume), ‘a photographer, artist, mother and teacher’, and to Giuido Vermeulen, also an artist. Most of the poems are written in the past tense, and/or in sentence fragments. Stone’s idiosyncratic diction and surreal use of unexpected juxtapositions conveys a restless, intelligent energy. I imagine the ‘straits’ of memory as narrow channels, through which the poet pursues what’s lost or broken or gone. These are often desperate straits, but there are also many moments of irony and absurdity. “A full-time poet?” she asked. “Yes,” I said. “We’ll see,” she said. Grief gathers in quieter pools in the central, elegaic poem sequences; Stone’s moments of steady realism are all the more potent for being relatively rare, like “The Birthday Party” held for a young man with autism, illuminated by ‘a brilliant field of night lights’. I was particularly struck by two sequences dealing directly with memory: “The Strait” and “Avenues”. In these streams of recollection, the poet moves with a critical eye through an underworld of cinemas, films, restaurants and other locations, all precious because shared with ‘M’. The bohemian underside of Chicago was not resonant to me before reading this vibrant and challenging collection. But I struggled, and was finally won over. As in collage, Stone shreds and reassembles aspects of personal memory, cultural icons and known narratives; the reward is that with some effort on the part of the reader, the poems do eventually spring vitally alive.